Therefore, campaign finance reform = violation of the First Amendment. 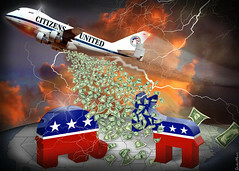 As fallout, we are now witness to the proliferation of super PACs — those well-financed, secretive, unaccountable organizations that can raise unlimited amounts of cash to help or hinder politicians of their choosing. This growing confluence of money and politics has brought the tone of political debate to a new low, and undermined what little pretense remains of popular control over the democratic process. Fantastic work is being done by communities in Vermont, as well as by politicians such as Senator Bernie Sanders, to push for a constitutional amendment abolishing corporate personhood. But amending the US Constitution is an almost prohibitively difficult thing to accomplish. There must be a backup plan. It is here that progressives can learn a thing or two from Grover Norquist, president of Americans for Tax Reform and architect of the euphemistically named Taxpayer Protection Pledge. Hundreds of American politicians at all levels of government have taken this pledge to never under any circumstances raise taxes — not because it makes their job of governing easier, but because it represents something that, for better or for worse, many voters want. Norquist and his ideological brethren have successfully achieved for their anti-tax zealotry a cultural hegemony that ought to be the envy of the Left. This hegemony, in all its principled rigidity and uncompromising absolutism, is precisely what needs to be replicated for the cause of campaign finance reform. Thus I propose (in comparably euphemistic language) the Democracy Protection Pledge, or, informally, the Alternative Norquist Pledge. (In my research for this post, I discovered that a similar — though not identical — proposal was made within Occupy Springfield, Il.) All politicians who wish to brandish this progressive seal of approval must, in writing, forswear all super PAC cooperation, refuse all super PAC assistance, and promise to support a constitutional amendment abolishing corporate personhood. Progressives could try to use this pledge to apply just as much pressure on politicians as Norquist has succeeded in doing with his pledge, and to make compliance just as politically advantageous. Will it be an uphill battle? Of course. When has it ever been otherwise for the Left? But what hangs in the balance is the integrity of one of the world’s oldest democracies. So I encourage you, American lefties, indulge your Norquist envy! This entry was posted in American Politics, Democracy and tagged Americans for Tax Reform, Bernie Sanders, campaign finance reform, Citizens United, cultural hegemony, Grover Norquist, Occupy Springfield, super PACs, Supreme Court, Taxpayer Protection Pledge, Vermont by David Taub Bancroft. Bookmark the permalink.